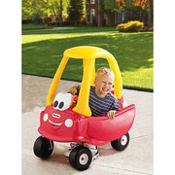 Our Cozy Coupe* Car is made of durable plastic and castor wheels and will provide hours of fun for your youngster. It features an opening door, cup holder and a roof for shade. It also has a removable floor and a rear mounted handle for parents to push. Colors and styles may vary.